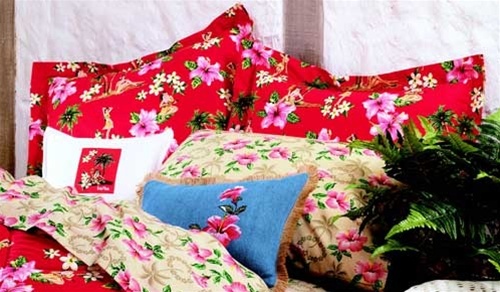 Pillow Shams are double sided Hawaiian Print Fabric with European cuts in the back. All beach patterns are available and look great to highlight your Dean Miller Bedding set. Standard size sham is - 22" x 28" Interior to Interior, with a 2.5" Flange edging. Made in the USA! Dean Miller's tropical pillow shams are also a great compliment to go with any bedding options you currently have, we can always add a little aloha to any beach house. Click on the tropical photo for a larger view or scroll your mouse over the Hawaiian bedding swatch pictures for detailed product shots. If you have any questions or concerns about Hawaiian beach decor, or want to order over the phone, please remember you can always call us at 949.698.6278 or chat online with one of our helpful customer service reps! All surfing patterns available as Shams, Click on Picture to see designs!